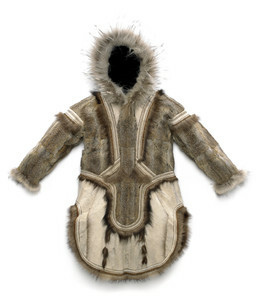 This is a northern-style woman’s fancy parka, a type made by both the Iñupiat and by Yup’ik residents of southern Norton Sound to Hooper Bay.The upper body was sewn from arctic ground squirrel pelts and the rounded lower apron is white reindeer or caribou fur. The dark trim and tassels are wolverine fur and the hood has a wolf hair ruff. Sheared and welted strips of white reindeer or caribou fur are accented with tiny loops of red yarn, and bands of alder bark-dyed reddish skin outline the fur panels.